Rubber Cable Ramp / Hump Protector accommodates either 2 / 3 / 5 cable channels. Display shown 2 channels Rubber Cable Ramp Protector. Size: 1000mm (L) x 250mm (W) x 40mm (H) for 25mm diameter cables fitting ( Front View- Cover Open ). Durable, cost effective, heavy duty made to protect cables and prevent hazardous situation associates with human tripping over cables. 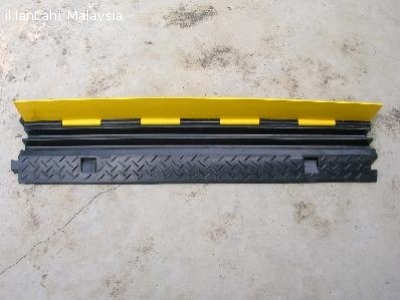 Rubber Cable Ramp / Hump Protector market and sale by Flexijoint Industrial Marketing & Services, Kuala Lumpur, Malaysia.